The PRS-2 Dreadnought is the culmination of a project which I believe has been in development for at least one year. Talking with Eddie Platts of Timefactors, the objective was to develop a serious and professional dive/tool watch with a specification to match (or indeed better) other offerings currently available. Furthermore, the purchase price should make the watch good value for money in comparison to others. The word comparison is interesting in this case: the Dreadnought is a limited edition of 200 examples, the specification is superior to many other dive watches and of course the name is new in the sense that the watch isn’t an Omega or a Tutima or a Rolex and so on. Therefore, to attempt to compare the watch with all would be competitors would be a very long and difficult task as there are so many watches out there that purport to be diver watches. My approach to the Dreadnought is to review the watch for what it is presented to be and to compare it with two others which I find desirable for their specification, looks, or even social status. As an ‘unusual’ watch with low production numbers I felt that a close match might be the Marathon SAR which comes close on price, intended purpose and relative obscurity and at the other end of the scale the Rolex Sea Dweller which is known to many as the ultimate dive watch, is well specified and ownership of which is a goal for many people. The major part of this review will of course be the Dreadnought; the comparison with the SAR and the Sea Dweller will come later and treatment of those will be as watches that I might purchase as alternatives. This review is not intended as a photographic one; whilst some images are included, you may find some excellent shots of the Dreadnought over at the Timefactors forum (link at end of this review). My thanks to Ernie Romers and Eddie Platts for letting me use some of his images – time constraints mean I haven’t been able to photograph the watch as yet, Ernie’s watch is 006, mine is 007 so that’s close enough! The name Dreadnought is well known amongst those with an interest in British Naval history and vessels have been bearing this title for two hundred years. Latterly, ‘Dreadnought’ was ascribed to submarines – indeed, Britain’s first nuclear powered submarine bore the title. This name would therefore be apt for an instrument designed to be at sea with the capability of being under the surface, at depth, for extended periods of time. For those readers who have viewed my review of Eddie Platts’ first limited edition project, the PRS-1 Speedbird (a pilot’s watch), you will have noted my excitement at the aura the watch created for me in terms of a bygone era – the watch summed up perfectly for me those things which seem long gone from aviation history. So, what of the Dreadnought? The watch has been eagerly anticipated by those waiting for its release (note that the 200 Dreadnoughts were initially offered to those that had purchased the first 200 Speedbirds). 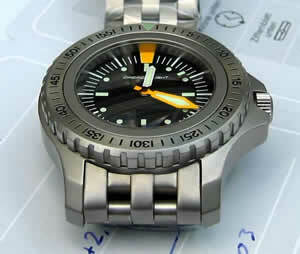 This is a sea going watch which embodies the old and the new in terms of name, functionality and design. Admittedly, my interest in things marine is relatively limited and the deepest I have been under the ocean is 35 meters but as many will appreciate, there are a lot of people out there who purchase a diver watch for its potential ruggedness – or rather that margin of safety which tells them that they can wear it any time, any place without having to worry. So, whilst the Dreadnought would not have the same effect on me as the Speedbird in terms of conjuring up images of eras gone, it most certainly has the desired effect on me in terms of those feelings one gets when one sees and handles a watch that will quite obviously be able to stand a lot of abuse, be it physical or environmental. For me, I have followed the development of the watch since inception and shared that anticipation with others of a watch that promised, on paper, to be outstanding. I do not purchase watches because of the packaging. A leather clad box means little to me but to many, packaging is important. It is part of the whole buying experience and may even make a difference at the point where a decision is made to purchase. The overall packaging of the Dreadnought is to say the least, superb. Attention has been paid to every area and full marks are due for the thought and consideration to detail which Timefactors has put into all those things around the Dreadnought. What we must not forget is the price: GBP450.00 including delivery. 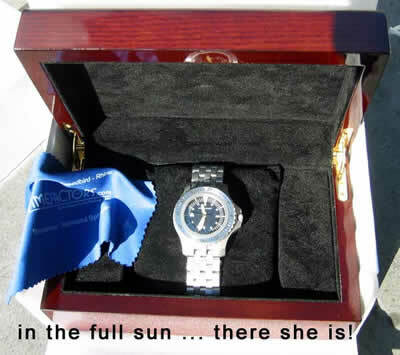 The watch comes in a large polished wood box measuring approximately 21cm wide by 13cm deep by 8cm high. The polish reminiscent perhaps of wood used on the interior of the Captain’s quarters on the very first Dreadnought? The watch sits nicely on a generously proportioned black felt pad which sits in the centre of the box – all lined in a black felt-like material. Of course, all this comes in an outer box, in this case of white card with a Dreadnought sticker applied to the top. Packaging the Timefactors way is comprehensive to say the least. On opening the box we are presented with a blue satin cloth bearing the Timefactors logo and references to other products from this vendor. A nice touch and of course we won’t forget where to go for Speedbirds, Rhinos and Broadarrows! In addition there is the International Guarantee card and a Timefactors business card, along with the Timing Certificate for the specific watch. For those who like the pieces of paper that come with a watch you will not be disappointed. 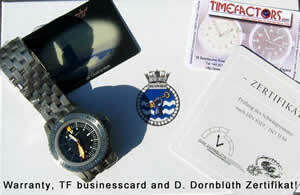 But there is more – a white envelope contains an interesting history pamphlet concerning the Dreadnought series of warships/submarines and a Care of Your Watch leaflet detailing precautions to be taken to keep the watch in tip-top condition. This wasn’t enough for Timefactors and for extra reassurance for those who may doubt the structural integrity of the watch, there are no less than three sheets with technical drawings of the watch case and bezel. These bear the name of the case manufacturer (Walter Fricker of Germany) and I feel that there is a real honesty to including these. I have never seen this done before and it is certainly interesting to be able to see every dimension of the case and the way in which it has been engineered to provide the durability expected of such a timepiece. As a final check I upended the envelope and out dropped a 22mm Rhino strap! Yes, there is more – Timefactors has provided three screwdrivers in a plastic tube. These are intended for bracelet adjustments and again, it is unusual to see such included with a watch at this price point, if at all. The inclusion of the screwdrivers gives a clue as to the attention paid to the strength and quality of the bracelet on which the watch comes. Overall then, the packaging of the Dreadnought is very comprehensive in an all round sense and attention has been given to areas often overlooked by other manufacturers. The Dreadnought case should be referred to as a hull! With a sandblasted finish, it is solid to say the least and proportioned in a way that the watch could be worn very comfortably by us ‘desk divers’ yet it has the heft and dimensions that make it suitable for those who actually need a watch for serious dive work. Of traditional construction with lugs and a screw down back, the case is interesting with the facets that have been incorporated into the top surfaces of the lugs. The lugs themselves have screwed bars (yes, spares have been included with the watch). This I feel is a nice touch which adds to the engineered feel of the whole watch. 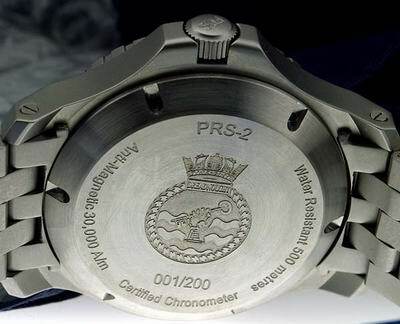 The crown (screw down) is actually tested to 2000m whereas the watch case itself is water resist to 500m; the crown in this case is signed ‘PRS’. The double ‘O’ rings under the 3mm thick case back are a very reassuring feature which leads me to believe that this watch would really stand the pressure of fifty atmospheres. The 3mm thick domed sapphire crystal adds to this feeling of strength and security; the dome and bottom surface anti-reflective treatment would no doubt aid underwater reading when at depth. Across the bezel, the watch measures 42mm – roughly the same as a Seiko automatic diver yet it looks and feels much bigger and heftier – indeed it is so given the overall depth of 15.6mm to the top of the crystal. The amount of sheer metal contained in the case is impressive, there are no ‘thin’ areas – even the lug tips are the best part of 4mm wide. Distortion of the case through impact or pressure would appear to be very unlikely. The case incorporates both straight and curved edges and to my eye is aesthetically pleasing. With any serious dive watch, the bezel is of great importance – too long at a certain depth accompanied by too short a decompression time on the way to surface will result in, well – a great deal of pain at the least! The standard for a diver’s bezel is of course that it be uni-directional in order that any extra stays at depth are avoided. The Dreadnought incorporates this feature and is a one piece steel construction with engraved numerals with a black fill. Whilst the numbers on the bezel are not oversize, they are nevertheless easy enough to read with the reassurance of a good sized luminous triangle at the 12 which should aid reading under poor lighting conditions. The bezel ratchets at 1 minute intervals and is firm in action without being stiff. Personally, I prefer 120 clicks per rotation as this seems to make the action smoother. However, the Dreadnought’s bezel is well executed and matches the watch well – the top edge is brushed and the sides are sandblasted. Given that the serrations on the bezel edge are deep and extend the whole height of the bezel, then it should be easy enough to turn with wet hands. Finally to the back of the case. As previously mentioned, it is no less than 3mm thick with six slots for a removal tool. Beautifully engraved with the Dreadnought crest to the centre, the case back also lets the wearer know that the watch is Chronometer Certified, Water Resistant 500 meters and anti-magnetic to 30,000 a/m. Such antimagnetic properties are achieved in some part to the incorporation of the movement dust cover and holding ring. For professional diving use, the anti-magnetic properties may be useful in certain circumstances and for the casual wearer, they will no doubt help to protect against the influences of magnetism present in everyday equipment around the home! The dial and hands of the Dreadnought borrow heavily on the design of the Omega Ploprof of the early 1970s. They are not however, exact reproductions. The dial itself (soft iron) is of a matt black finish and contains all of four words in total: DREADNOUGHT below the 12 in an attractive italicised script and at the very bottom of the dial: Made in Germany. And that is it. I have to give the watch full marks for this as in my opinion there is no excuse for chapters of verse on a watch dial. Particularly on a dial intended for professional use. 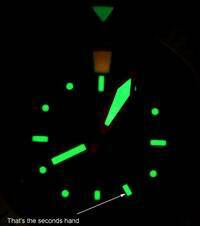 At the 12 there is a large orange luminous marker which does glow orange – the dots and batons are in a pale green Super Luminova as is the fill on the hands. Thankfully, the colour of the luminous matches all the way round which is appealing to me. The dial and hands hold a good glow which seems to last well, given that the compound must be charged by light to be effective. The date window is at the 6 and does not interfere with legibility at all. Use of white lettering on black for the date helps further and one does have to look twice to see the date (which I see as a good point in this case). There is generous Luminova fill to the hands; the large orange minutes hand a trademark of a ‘real’ diver’s watch. The white hours hand is large enough to see well, yet distinct enough from the hours hand to ensure no confusion. Both hands are very reminiscent of the Omega referred to earlier. The seconds hand is in matt black with a luminous rectangle toward its tip. This gives a ‘floating’ look to the hand as it moves and helps to focus attention particularly to the minutes hand. Some argue that a quartz movement is the best solution for any timekeeping job. Certainly, a quartz movement will in almost all cases be more accurate. Then again, a quartz movement relies on an exhaustible battery in most cases. This is where it can be argued that potential disaster may happen should a battery die if one were diving at depth. I would argue that such instances would be rare, if happen at all given battery charge warnings and so on. I would say that in the case of a professional diver, then it is possible that cold may affect a quartz movement to the degree that it may stop. The Dreadnought employs an automatic movement – the advantages of which are that it will not stop due to a dead battery and that it will continue to run accurately under varying temperature extremes – particularly given the relative short duration of dives. In this case, the movement is the ubiquitous ETA 2824 but in 2T form which is the higher grade of this calibre. It is a proven design, is rugged and has been entrusted to countless watch executions over the years – from dress type watches to heavy duty tool watches including the Tudor Submariner. Seen in very basic form in watches costing less that GBP100.00, the 2824 can also be seen in highly refined form in those costing upwards of GBP1000.00. In keeping with the creation of a watch of high specification, Timefactors have chosen to go the whole way with the movement and as well as using the top grade 2824 (which incidentally is decorated with Geneva stripes and perlage), they have chosen to have it adjusted to within Chronometer specification for each of the 200 examples of the watch. Assembly, timing and final proofing of the watch has been undertaken entirely by Master Watchmaker Dirk Dornbluth and he has filled in the Timing Certificate for each watch. In the case of my example (Serial number 007), the overall rate for the watch was +1.2 seconds per day, demonstrating just how accurate this movement can be. Basic features of the movement are 25 jewels with bi directional winding, hack seconds and quickset date. The 2824 beats at 28,800 per hour, ensuring some stability in rate. I feel that the 2824 was a good choice for the Dreadnought given its ruggedness, reliability and ability to be adjusted to well within Chronometer accuracy (which is +6 -4 seconds per day). As a preferrer of straps, I felt that I might be a little indifferent to the bracelet on the Dreadnought. Suffice to say, this will be one watch on which the bracelet will remain. 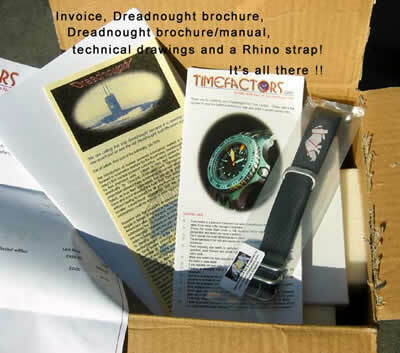 Timefactors have of course included a rugged Rhino strap and the tools necessary to remove the bracelet for those who prefer to swap now and again. Why will I keep the bracelet on the watch? Firstly, I like the fact that it does not taper – the width at the lugs is 22mm and this remains the same throughout the whole length. Just a personal preference but I do prefer a ‘square’ bracelet. The end pieces are solid and whilst they don’t follow exactly the facets of the lug tops, they are certainly in keeping with the watch and fit tight and snug with no play. The bracelet itself has five rows of solid links, sandblasted both sides with the finish matching the case perfectly. The length of the bracelet out of the box looks as if it would fit King Kong – I had to remove no less than six links to get the watch to fit my (6.5 inch) wrist. The links are a fraction under 4mm thick and removal is by screws as opposed to the more common push pins or split pins – another demonstration of the attention to detail which has gone into this watch. Fine adjustment can be made at the clasp by the usual spring bar and hole method. Being a diver’s watch, the bracelet features an double folding extension in order that the watch can be worn over a wetsuit; this fits neatly into the clasp and can be released with a simple flick of the thumb. The clasp itself is signed ‘Dreadnought’ and features the nowadays common folding safety catch to ensure accidental opening does not occur. The folding hinge within the clasp itself is not too long and thus fits my small wrist comfortably. Indeed, the bracelet as a whole is very comfortable and provides a counterbalance to the not inconsiderable weight of the watch head (140g). Incidentally, the total weight of the Dreadnought at 265g including bracelet means that after removing links, I have an almost 50/50 balance of weight distribution above and below the wrist! Overall, I have to say that I think that Timefactors has made a superb job of a watch that was little more than an idea just eighteen months or so before the first watch was delivered. Reading this review thus far hopefully brings out the thought and attention to detail that has gone into it. There would appear to have been no compromises made in executing a watch that is designed to be a serious tool as well as an every day wear watch for those who like something a little different. It may be a little too large for those with small wrists but even in this respect, it doesn’t seem so when worn by me. Furthermore, it is heavy but then again doesn’t feel so when worn. The pedigree of those involved in the manufacture and testing of the watch is open to little question and coupled with the overall presentation, one has to wonder just how this can be done with a selling price of GBP450.00. Rather, it makes one question the selling prices of other watches on the market which offer a lesser specification for double or more the price of the Dreadnought. 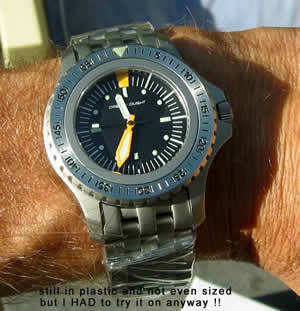 Given that there are many diver’s watches on the market, it would seem prudent to introduce ‘competitors’ into the equation at this point so I will consider the two alternatives mentioned earlier, perhaps not in as much detail as the Dreadnought, but certainly from the perspective of a potential purchaser. The Marathon SAR (Search And Rescue) is apparently manufactured for issue to Canadian Coastguard personnel under a Government contract. The cost of the watch on standard issue strap is USD485.00 and bracelet will cost an extra USD140.00 making a total of USD625.00 plus shipping. The cost of the Dreadnought equates to approximately USD720.00 including shipping. The watch comes in a standard issue brown cardboard box 7.5cm by 7.5cm square and 2.2cm deep with a sticker on the outside featuring the manufacturer’s name and address and the contract number. In addition to the watch and strap, there is a single 9cm by 9cm instruction sheet showing the three positions of the crown. For those who enjoy comprehensive and attractive presentation of a watch, then you will not find this with the SAR – this is standard military fare, plain and very simple. Aesthetically, I find the overall look of the SAR to be attractive – it is in many respects classically styled in terms of a diver’s watch. This extends to the case which is all brushed and features a traditional design down to the contours and lug shape. The thickness of the case band itself adds to the watch’s heft, though at a head only weight of 93g it is almost half the weight of the Dreadnought. Again, this is not a criticism. The watch is thicker overall than many watches with a 300m water resistance rating and personal preference would dictate whether this is a desirable feature or not. Much of this thickness is dictated by the bezel which is 5mm in height. The crosshatch pattern screw down crown is very easy to manipulate and screws down easily to the case, it is unsigned as might be expected of a military specified watch. The case back features military markings in terms of dates, contract numbers and an individual serial number; in addition there is indication of the type of steel used (316L, as per the Dreadnought) and the depth rating. For me personally, the most attractive aspect of the SAR is the bezel (which measures 41mm), it is the reverse of the Dreadnought with a black insert and white filled numerals/markings. Nicely done and with a luminous triangle at 12. I have heard of problems with the triangle falling out and do not know if this has been rectified in current production models. The bezel ratchets smoothly with large serrations which would be as easy to use as those on the Dreadnought. The SAR features a sapphire crystal with a cyclops lens over the date. Again, personal preference would dictate a like or dislike of this feature though I believe that the cyclops can be removed if desired. The incorporation of a cyclops I do find surprising on a military watch. The dial of the SAR is matt black with traditionally styled Luminova (Marathon termed Maraglo) indices; the date at the 3 is very visible under the cyclops and there is little script on the dial save for ‘Marathon’, ‘Automatic’ and ‘300m/1000ft’ As with the Dreadnought, this is in keeping with a watch designed for a specific purpose. The hands of the SAR are matt white with a red tipped seconds hand with the hours and minutes hands styled in the manner of US military diver watches of old. Unfortunately, the colour of the luminous compound does not match that of the dial which I find distracting. It would seem that the fault (if that is the correct word) lies with the luminous on the dial. It is a grey/green colour whereas that on the hands is a more light, ‘fresh’ looking pale green. The SAR uses the ETA 2824 movement as employed by the Dreadnought, only in this case it is a basic execution of such with, I assume, no adjustment. The movement is not protected by a dust cover and is held in place by a standard retaining ring. I cannot comment on the SAR bracelet as I do not have one to hand; I do believe however that it employs solid end links and solid main bracelet links with screws. Thus in specification it would appear to equal the Dreadnought. The SAR measures 20mm between the lugs as opposed to the 22mm of the Dreadnought and tapers I believe. A diver’s extension is a feature as it should be. From what I have seen online of the SAR bracelet, it looks solid and heavy and of good quality. With a safety clasp and an engraved logo (a Maple leaf) I would put the SAR bracelet on a par with the Dreadnought on specification. However I cannot compare physically. Overall, the SAR is an attractive watch which I feel would make a good everyday wearer. It does not have the ‘presence’ of the Dreadnought nor the heft, no criticism here, it is just that the SAR is standard fare. There is simply less metal so to speak. It is a decent, basic, no frills diver’s watch which I assume has been built to a budget given its military connections. Personally, I would rather spend the extra USD100.00 or so on the Dreadnought. Why? Specification, execution, presentation, engineering and attention to detail would be the main factors. Were the SAR on the market for USD250.00 I would buy one in addition to the Dreadnought! The Rolex diver’s watches including Submariner and Sea Dweller are with little doubt considered to be the classic watches of this type of all time. Few would disagree with this. They are also considered to the best watches of this type. Perhaps a few more would disagree with this. The Sea Dweller is priced at approximately USD3750.00 so in terms of price alone, it is way out in front of the Dreadnought and the SAR. The Rolex comes presented in the classic green Rolex box with suedette pillow, cover and lining. This sits in a cardboard outer. In terms of ‘extras’, it comes with two booklets, one specific to the watch itself. In addition there is a wallet containing extra links and link tool, as well as a dive table and calendar along with the Guarantee and statement of Chronometer Certification. Rolex are guarded with actual performance results so there is no actual timing certificate. In actual fact, Rolex are guarded with just about anything and some people consider them to be somewhat over-possessive with customers’ watches. So, the Rolex packaging is very good and I believe has been improved of late to some degree. Of the three watches in question, the Rolex appears to be the smallest; across the bezel it measures 39mm. The case band itself is the thinnest of all three but the case back goes some way to making up the overall thickness of 14mm. Yet the watch doesn’t feel that thick when worn. Of the three watches, it is perhaps the one most discreet; however, the less desirable elements of society will know what it is straight away making some wearers a target. The case top surfaces are brushed with the sides being beautifully polished. In this respect, the Rolex is perhaps the dressiest of our trio. It also incorporates a helium gas escape valve (referred to on the case back) for use when saturation diving. The Rolex has the maximum depth rating of the three at 1220m. The curves and cuts of the Rolex case are classic and in my opinion very attractive and of course, imitated by many. The screw crown on the Rolex is the Triplock, larger than other Rolex crowns it is easy to grip and beautifully smooth to screw onto the case. Rolex of course pioneered the screw down crown and this certainly shows in this case. It is signed with the Rolex coronet and three dots. The bezel is a classically configured diver bezel with a replaceable insert in black; this is smooth and the numerals are in silver. The bezel clicks at half minute intervals which I prefer and the action is firm but not too tight. The serrations on the bezel are the most difficult of the three watches to grip and I could imagine some slipping with wet hands. Rolex have used cyclops lens on their crystals for many years and this may be where the influence stems for the SAR crystal. In the case of the Sea Dweller, the cyclops is not present which I prefer. The crystal is sapphire and of the three watches, the Rolex crystal is the most susceptible to damage as it protrudes a good three quarters of a millimetre above the bezel. I have heard many stories of these crystals being chipped. If replacement is required, then the price will reflect the perceived exclusivity of the watch! The Rolex dial is deep gloss black (with far too much script present); beautifully finished but under bright light it can reflect to an almost blinding degree. I do not understand why Rolex ever changed from the old matt dials which in my opinion were eminently more suited to sports watches. There is a dressiness to the dial which personally I dislike, however, Rolex are usually able to anything they please and people still come back for more. The dial indices are in white gold, applied and filled with Luminova. Again, the Rolex sports watches of old did not have such, indices were simply luminous (and larger than those of today). They are nonetheless attractive and still large enough to see easily. As for the hands, well they are of course the classic (again!) Rolex sports hands with hours hand being the ‘Mercedes’. Although nicely finished in white gold, I find the amount of luminous fill (Luminova) too little for a serious dive watch. The hands, in m opinion should be fatter. Both the Dreadnought and the SAR beat the Rolex in this respect as far as I am concerned. Watch enthusiasts make great store of a movement being ‘in-house’ – that is to say, manufactured by the watch manufacturer. In the case of the Rolex, this is indeed the case and the Sea Dweller features the 3135 calibre with 31 jewels, bi-directional winding and 28,800 bph. It isn’t my intention to give a lot of technical detail on the Rolex movement – suffice to say that it is well proven (but not without its faults), reliable and long lived. What is inside the Sea Dweller however, will be of little consequence to the vast majority of those who purchase the watch. The Rolex bracelet is the classic Oyster with solid outer and hollow centre links. Over time, these bracelets stretch to some degree, however this will probably be the case with most metal bracelets. Some argue that the use of hollow centre links is a cost saving measure, others argue that it helps when wearing the watch at depth. Whatever the case, the bracelet is of a good standard of manufacture (though not top class in my opinion) and features very hefty screws for link removal. The clasp is double locking with folding safety catch and diver’s extension. For my tastes, the clasp is a little too long and with smaller wrists it is very difficult to get it positioned comfortably under the wrist. Does the Rolex rise head and shoulders above the Dreadnought and SAR? Or indeed should it even be on the list for comparison. I feel that it is worthy of comparison certainly on specification. It is undoubtedly a fine watch but I have to say that on specification, it is massively overpriced. I don’t think that it does anything better than the SAR or Dreadnought; the looks are of course personal preference and I do find it very attractive – compact and tough but with weak points such as the protruding crystal. The one thing that is does have of course is the NAME! This would be the main factor for many looking for a sports watch but for those seeking a tool watch the choice might very well be different. As a watch appreciator, I have progressed to the stage where I do look beyond a name when purchasing. Here we have three watches all designed for a very similar purpose. The Dreadnought is as yet unproven in the field (or sea! ), the SAR has been around longer (around 2-3 years though I have heard of a leaking incident) and the Rolex has been around as the Sea Dweller since 1971. I would say that at today’s price, I would not purchase a Sea Dweller – whilst I would not deny anybody a profit, I feel that despite its pedigree, the Rolex would be a worthwhile purchase at maybe USD1500.00. Therefore, if I had to replace a Sea Dweller, I would not buy another. I may have mine refurbished, but then this can be an expensive exercise (though Rolex do a superb job). Potentially, the SAR or Dreadnought would do a better job for me if I were a serious diver. Why? Well, clarity of dial and hands is a major factor, along with ease of bezel use. I do like the classic look of the SAR though I feel the specification is not up to that of the Dreadnought. The Dreadnought would appear to give one so much more for the money; in this respect I am talking about the watch itself, not just the papers and boxes that come with it! 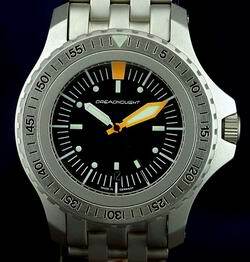 I appreciate that as a military watch, the SAR may have been designed to a budget using mainly standard components – therefore I stand by what I said earlier in terms of its price, I feel that it is too close in price to the Dreadnought to ignore the Dreadnought – the extra USD100.00 or so for the latter certainly gets you so much more. The looks of the Dreadnought may be an acquired taste for some, but as a real tool watch they may be irrelevant. Perhaps then there is no real conclusion to this ‘dilemma’. Value for money, the Dreadnought wins hands down and would do so over many other watches. Fitness for use (i.e. as a ‘real’ diver’s watch), I would say that the Dreadnought probably comes top in this department too unless a helium escape valve is a real necessity. For ‘image’ and status, then we’re over to the Rolex, no question about it. One thing that the Dreadnought does prove (leaving the SAR and Rolex aside), is that is possible to produce an extremely well specified watch at an almost unbelievable price – or rather, there are an awful lot of overpriced watches out there! “An increasingly rare occurence yesterday (the posting of a Dreadnought for sale) got me thinking about the watch. It is, in my opinion, virtually unique in so many ways that it doesn’t get credit for it all. As a watch, it is a formidable piece that spawned a cottage industry of clones, near clones, and homages. It is BIG, 44mm with that titanic 54mm lug-to-lug spread, heavy, solid, and feels bullet proof. The dial is the epitome of ‘less is more’, and may be rivaled only by the EZM1 for simple easy to read functionality. The bezel reads easily, too, and turns smoothly under all circumstances with its wide-spaced geartooth edge. The massive Fricker case with integral crown guards also lends itself to the distinctive design. And the use of those ploprof hands (before the myriad of copycats) ensured that the actual time, or elapsed time, would be a cinch to see at just a glance. Often overlooked, though, is the close attention paid to the heart of the watch: each one regulated – blessed, really – by Dornbluth. As an example of this wonderful attention to detail, the DN I personally owned ran +1 second a day vs NIST – an error rate of roughly 1 in 100,000. 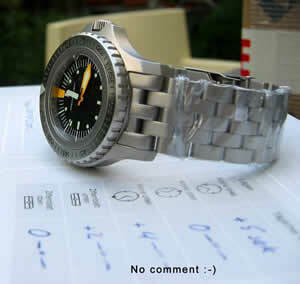 So it excelled in its primary purpose, of serving as a rugged diver’s watch. But it also blazed another trail – it proved that there was a market for small run, niche watches that catered to a specific group. In order to do so, it had to be visionary (ok, its creator had to be visionary). The size was very unusual in its day – in 2003 most folks still considered the Sea Dweller to be a big watch, and thought the Aquatimer at 42mm a bit outre. The use of the iconic ploprof handset is another nod to the WIS it was aimed at. There are so many features it has which are now commonplace – but which were practically unknown at its inception, that its hard to remember pre-DN sensibilities. The cool ‘lumpy’ style bracelet, now ubiquitous; that Fricker case, used by the dozen now; as noted, the ploprof hands that previously inhabited only the rarified ugly-diver world; and, the neat engraved back harkening to the HMS Dreadnought. Most of all, the price it was released at! Its production proved that a very high quality watch, with all the bells ‘n’ whistles, could be brought to market at an affordable price. What a stroke of genius, there. Sure, a limited edition of 200 units made it highly desired, but the value versus cost cemented it as a viable idea. The price did not, though, create the near mythic status it has since attained. The design and quality gets the credit for that. Tagged Dreadnought, PRS-2. Bookmark the permalink.